War has always had a great impact on campus culture and the day-to-day lives of students. World War I was no different at UK. The university quickly responded to the demands of war by offering more convenient terms for academic credits for those students whose education was interrupted by military service. In 1918, the university contracted with the government for the training of military personnel in technical skills. Between May and November of 1918, three detachments went through the training courses. Barker Hall’s Buell Armory became a workshop for truck maintenance and repair. The regular soldiers lived at the trotting track on South Broadway until barracks were built at the east end of Stoll Field. Male students at the university entered the Students’ Army Training Corps (SATC). At this time, the campus became a combined military post and academic institution. 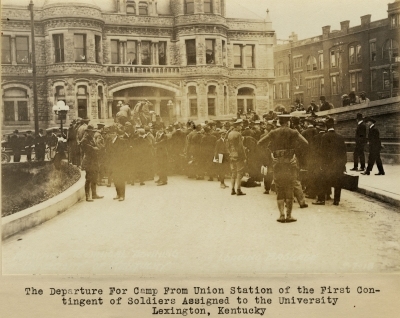 The training of soldiers was organized by UK President Frank L. McVey as executive head of the operation; Major Justin W. Harding (U.S. Army) commanded the troops; and UK Dean F. Paul Anderson (College of Engineering) was appointed head of technical training. Anderson began on the first contingents' arrival, May 7, 1918. Barracks were constructed on land owned by the Kentucky Trotting Horse Breeders' Association. Soldiers received eight weeks of general training before training for specific assignments. UK Professor of Engineering and Drawing L. E. Nollau was designated photographer for the training sessions. At the very beginning of the soldiers' training in technical subjects there was a well-defined organization effected. There was no encroachment on the time allotted to technical training and to military training. Every man was accounted for every day, and the individual record of each man showed how his time was occupied from the hour he reported to the military technical training course until he was sent away. In all branches of the work, the men were put under the instruction of the most skilled artisans in their lines. The blacksmiths were under the supervision of the most expert men in this community. The carpenters were trained by men taken out of recognized contracting organizations in Lexington. Auto mechanics received their instruction in 20 independent shops organized on the UK campus, under the tutelage of the best garage foremen that could be secured. The demonstration material in the automobile shops consisted of private cars sent for repair. The contingent of auto mechanics shown in the records reconstructed and repaired more than one hundred automobiles during the eight weeks they were under instruction. The electricians were placed in charge of electrical contractors who were men of wide experience in house wiring. The telegraphers and wireless operators were taught by experienced telegraph operators taken right out of the active service of railroads and wireless stations. Lectures were given to various groups every day and great stress was laid upon the theoretical side as well as the practical. These soldiers were well trained and well fed, and when they left UK they were fit for the fight ahead. 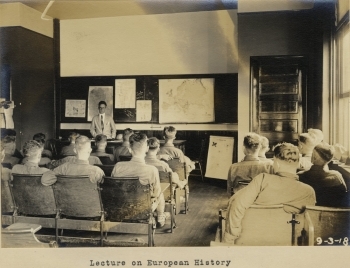 By December of 1918, the university was once again a civilian institution but as a land grant institution, military training was still mandatory. 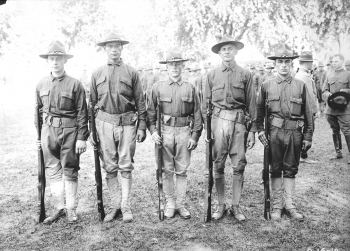 Thus, the Reserve Officer Training Corps (ROTC) became a requirement for all male students until 1963. Women were allowed to enroll beginning in 1966. This story on UK's history is presented by UK Special Collections. Special Collections is home to UK Libraries' collection of rare books, Kentuckiana, the Archives, the Louie B. Nunn Center for Oral History, the King Library Press and the Wendell H. Ford Public Policy Research Center. The mission of Special Collections is to locate and preserve materials documenting the social, cultural, economic and political history of the Commonwealth of Kentucky.